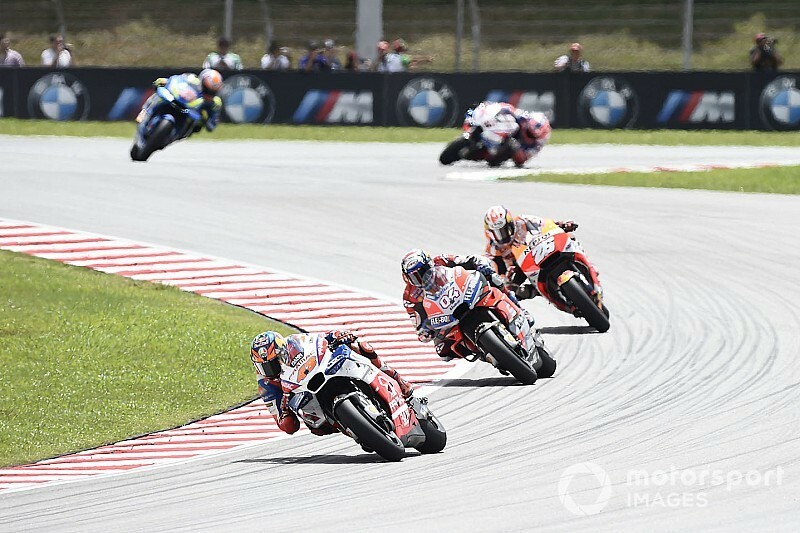 Jack Miller says his gamble on a medium compound rear tyre in the Sepang MotoGP race was an 'educated guess' and a bid to break the follow-the-leader nature of racing the factory bikes. Miller was the only rider to start the Malaysian GP on a medium compound rear tyre, with hopes that the searing temperatures thanks to the earlier race start might give him the edge over the rest of the soft-shod field. However the gamble didn't really pay off for the Pramac Ducati rider, Miller ultimately coming home eighth for a third consecutive year at Sepang. "You have to get 20 laps right here and not just one, so we went for the medium-compound rear tyre, and I was the only one of us on the entire grid to race it," Miller wrote in his Red Bull column. "It was a bit of an educated guess for all of us with tyre choice, and mine didn’t work. "I wanted to do something different because it was the hottest it had been all week, the track temps were up around 54 degrees [Celsius] before the race. "When you're racing the factory guys, doing the same as them with tyres means you're going to probably finish behind them because of the equipment they have. It'd become a game of follow-the-leader where you know where you'll finish, more or less. "If the medium tyre had have paid off for me today, it would have looked like a masterstroke. You have to try to do something different to come up with a different outcome. "I'm not under any pressure from behind in the championship, there's nothing to lose, so I thought I'd give the medium a go." Miller added that trying to keep up with the lead pack early led to a vibration in that medium rear tyre, while a moment at the final turn tore his leathers to shreds. "I had to spin the tyre too much too early to stay with the front guys, and the tyre actually spun on the rim and it went out of balance," he explained. "So I had this mad vibration for half the race. It got worse as the race went on. "I had a big save at the last corner on one lap, I wore right through my leathers on my arm, not even the elbow slider. So it was a lucky save, for sure."